James R. (Jim) Newby is the Minister and Public Friend at Cincinnati Friends Meeting. He began his second tenure here in April 2016, having served here previously from 1975-1980. The son of a Quaker minister, Jim is a member of the Religious Society of Friends and has served as a minister among Friends in Nebraska, Ohio, and North Carolina. He has been the Editor of Quaker Life magazine, and served on the faculty of the Earlham School of Religion in Richmond, Indiana for ten years. 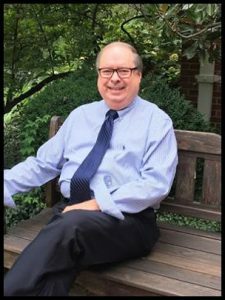 Jim holds degrees from Princeton Theological Seminary (Doctor of Ministry), William Penn College (Doctor of Divinity), Earlham School of Religion (Master of Divinity), and Friends University (Bachelor of Arts). He has written numerous books and articles on religious and spiritual subjects, primarily dealing with renewal. His most recent books include Sacred Chaos: One Man's Spritual Journey Through Pain and Loss and Shining Out and Shining In: The Biography of Tom Tipton. Since the death of his mentor, D. Elton Trueblood (whose biography he wrote in 1990), Jim has assumed leadership in the international Yokefellow Movement, and is the President of the D. Elton Trueblood Yokefellow Academy Endowment, Inc.
Jim is married to Elizabeth Salinas Newby, author of A Migrant with Hope and a specialist in matters concerning immigration. She is the former Administrator of the Division of Latino Affairs for the State of Iowa, serving under former Governor Vilsack. They have one daughter, Alicia Marie Clark, who lives with her husband, David, near Indianapolis, Indiana. For relaxation, Jim likes to play golf, sail, and walk, as well as spend time at their home on the coast of North Carolina.